The Mahlke Chronicles: Holiday Traditions: Santa vs. Jesus. Santa visits. Christmas lights. Gifts. Parties. Cookies. Crafts. Activities. Running here and there. It's so easy to lose sight of the real reason for the season. I try to incorporate the commercialized side of the holidays with the religious in hopes of balancing out the two and teaching my children what Christmas is truly about. Santa isn't just the big fat guy dressed in red who rides in a sleigh to spoil you rotten with gifts. In my house he's a messenger--someone who reminds us to appreciate our loved ones by giving them homemade goodies. I can't say for sure this has been successful just yet, but we keep trying anyway. In between Santa visits and holiday activities, we've been weaving Jesus into the fold. Spencer often asks to read God's book (aka his Children's Bible), so we focus on Baby Jesus' birthday story. There is something magical about the fictionalized story of Santa, and I would never dream of ruining that part of the holiday for them. But I hope we are still able to pass on the magic of Jesus' birth, too. It gives me tingles as I sit in a church pew and watch the Sunday School kids reenact the old familiar story and sing the favorite carols. It is that one hour in church while the kids--who once upon a time used to be me and my siblings and cousins and childhood friends--remind us all about the true meaning of Christmas that causes me the greatest holiday joy. 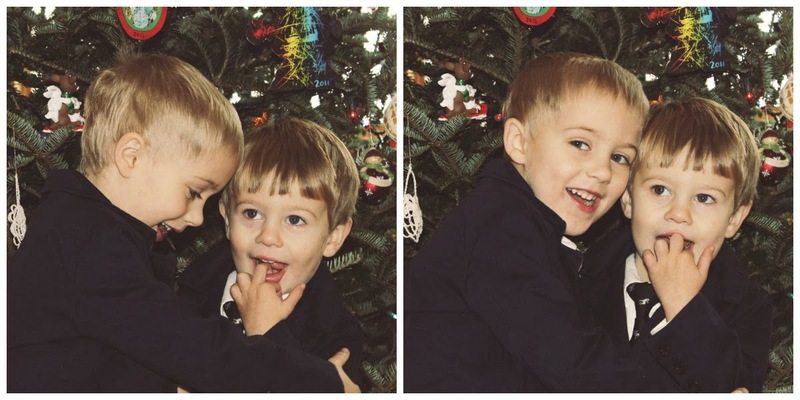 I want that feeling to be embedded into my children's Christmas memories as well. So we balance both the commercial side of the holidays with the religious, and somehow manage to incorporate it all. 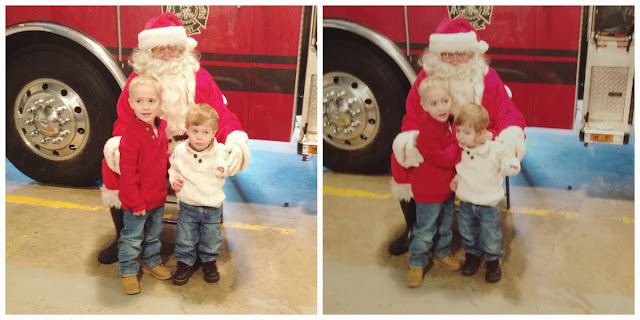 This year we happened to see Santa three times. 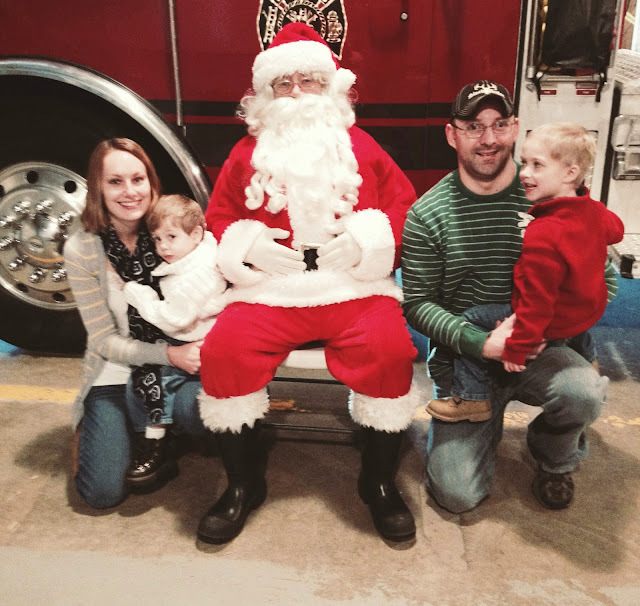 The first time was at the local fire station, where Spencer eagerly bounded up to him and immediately told him he wanted an Octonauts toy for Christmas. Ashton wasn't as enthusiastic to meet the strange guy and he had to be coaxed up there a bit. 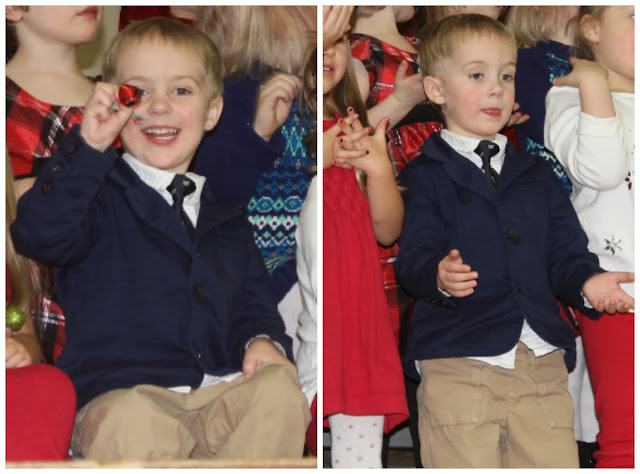 The next time was at the Rotary Lights, and the final time was at Spencer's preschool concert, Supper with Santa. By then both boys shared in their excitement and rattled off that they'd like an airplane. At each visit I whispered to Spencer: "Is this the real Santa or just a helper?" And each time he smiled conspiratorially and confirmed whole-heartedly that they were in deed the real deal. It's hard to argue with that much conviction. 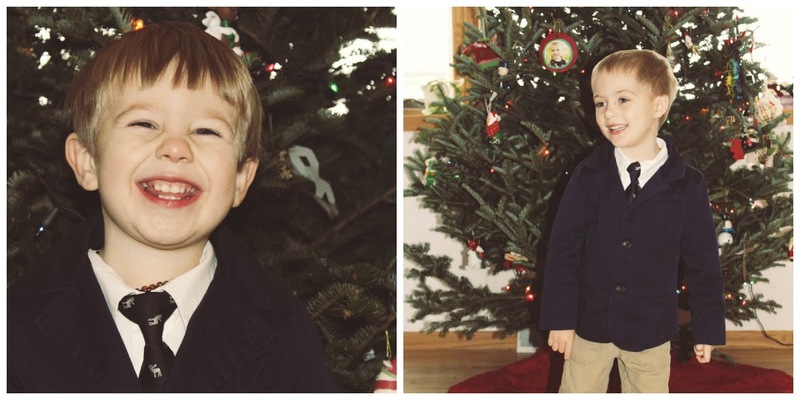 On the morning of Spencer's Sunday School program, we dressed the boys in their recycled Easter suit jackets and ties, and I stationed them in front of the Christmas tree for a photo-op, gushing about how handsome they are. Then Ashton sat out for his last time as we watched Spencer stand before the entire congregation and lip sync the songs, donning the sheep hat another year. Next year Ashton will participate, and Dave and I will be childless in our pew, watching with cheesy smiles plastered on our faces and sentimental tears in our eyes (ok, my eyes! ), snapping picture after picture.